Migrating, managing and more: Real IT pros. Real advice. Are you considering moving your business applications to the cloud? If so, keep reading! Microsoft recently commissioned a study with IDG that looks at the experience of IT pros who have already moved enterprise business apps to the cloud. The findings are published in an e-book designed to help you learn from the experience of others so you can improve business performance and position your organization for the future. 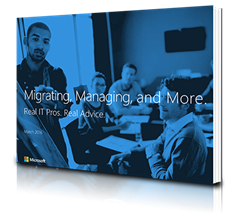 Download the e-book: Migrating, Managing and More: Real IT Pros. Real Advice. Azure powers business apps from SAP, Oracle, IBM, Red Hat and Microsoft providing global scale, consistency and seamless integration with on-premises environments. Azure G-Series and D-Series virtual machines run on the latest Intel cloud technology to deliver performance and reliability that can handle your data-demanding and transaction-intensive business applications. You can also get more out of your existing Microsoft licenses with the ability to move Windows Server and Windows licenses to Azure, just as you can with other popular Microsoft products, such as SQL Server and SharePoint. Learn more about running your business apps on Azure.